Sonos Beam is a new compact soundbar with HDMI and voice control | What Hi-Fi? 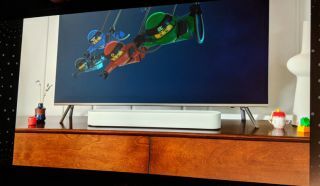 The multi-room master has announced the Sonos Beam, featuring HDMI ARC for the first time, plus AirPlay 2 and Siri voice control. The Sonos Beam promises to be a "3-in-1" soundbar, combining voice control, compact dimensions and access to all the streaming music services. Sonos claims it's 60 per cent smaller and 20 per cent shorter than the current Playbar. And, like the Playbar, you'll have the option of adding extra Sonos wireless speakers, including a Sub, to create a complete surround sound set-up. Sonos claims the Beam has been designed to deliver clear vocals, a wide, spacious sound and the best bass performance possible. Inside the soundbar the Beam uses four, custom-built elliptical full-range woofers, three passive radiators and a single tweeter. Touch controls are located on the top and the speaker is also compatible with Sonos' Trueplay audio calibration technology. The tech allows you to tune the speaker's sound (via series of test tones) to suit your particular room layout. Where physical connections are concerned, the Beam has power, ethernet and, for the very first time, a single HDMI (ARC) socket positioned around the back. The Beam comes with an Optical Audio Adapter for TVs that don't have the feature. Out of the box, the Sonos Beam will support Amazon Alexa in the UK, US, Germany, Canada, Australia, New Zealand, with France to follow shortly. You can buy the Sonos Beam in either black with a black fabric grille, or white with a white fabric grille and it goes on sale 17th July, for £399/$399/€449. It's also available to pre-order from Sonos.com now. Sonos has also confirmed that Apple AirPlay 2 will launch across Sonos speakers from July, allowing you to stream direct from your iOS device to your Sonos system. Sonos One, the 2nd-gen Play:5, the Playbase and "future products", will all get AirPlay 2 with a software update. It will also bring Siri voice control of Apple Music to Sonos for the first time. What's more, Sonos demonstrated how Siri and Amazon Alexa can happily play nicely with each other across the same products. With a single supported speaker, AirPlay content can be streamed to other Sonos speakers in your system. Google Assistant? Sonos says it's working on it and wants to support all voice assistants - the same open principle that applies to streaming music services. Sonos promised smart speakers would take the internet from mobile to sonic, talking of "the sonic internet" with Sonos as the sound platform of the home. With more than a nod to the social media privacy debate that has been raging in recent months, Patrick Spence, Sonos CEO, said the company was “not in business of selling data and never will be”. Sonos launched its first soundbar, the Playbar, back in 2013, followed last year by a soundbase, the Playbase. These were followed by the Sonos One, the first Sonos speaker to feature Amazon Alexa voice control. Rumours suggested a new, smaller soundbar would allow the company to compete at a more affordable price, while also bringing new features to the Sonos range, such as HDMI connectivity.